If you've sat there watching the kids have all the fun in the past then the good news is that we have inflatable assault courses suitable for adults available for hire. Our Big Challenge assault course for adults is available in either 70ft, 95ft, or 120ft long versions and both include the usual biff bash tubes, crawling sections, up and under bars, cargo nets, & slides. If that's not enough they can be extended further with the addition of a pair of Flip Over Walls - see video below. 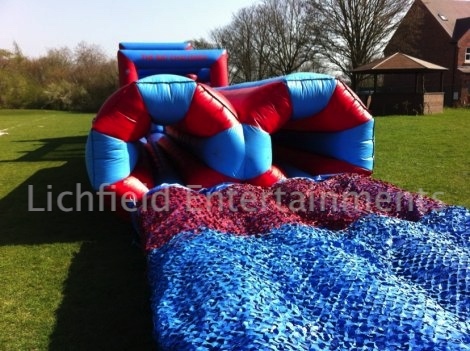 Our inflatable assault courses are always supplied with a trained member of staff to ensure their problem free use. 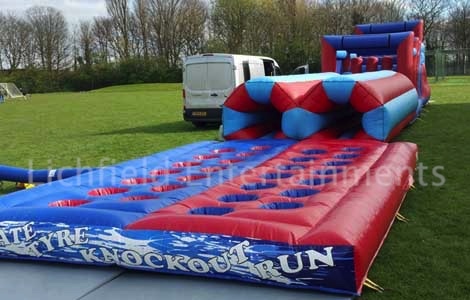 If you wish to hold organised races or team events using the inflatable our staff member will help out organising this for you. If there's no mains electric supply at your venue we can supply either a generator or petrol engined blowers as an additional option. If you have any queries, questions, or would like to book one of our inflatable assault courses for adults to use at your event please call us on the number below or click to enquire and we will do all we can to help.